Tag Archives for " Organic SEO "
There are many moving parts involved in marketing and the online elements increase in importance with each passing day. But, marketing is a system, and to effectively operate this system you must assemble and integrate each of the important parts into something that looks like the whole. Your online presence is your key to success no matter what your business sells – no matter if all of your transactions are done face to face – no matter if you don’t yet see a way to get a return from your Facebook page – no matter if you’ve never bought an online ad. The key, however, is to build a Total Online PresenceTM, much like you would a tall, sturdy building, by constructing floor by floor in specific order or in stages. Your stages may differ just a bit based on where you are today and you’ll surely come back and revisit, add on and revamp each stage as you grow, but I believe the following model is the surest way to view your online marketing as a system. 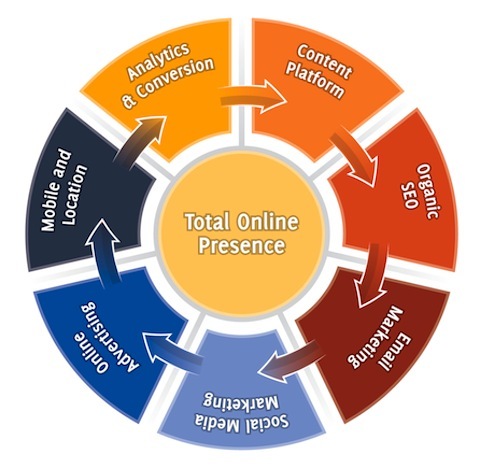 Below are the seven stages of building a Total Online Presence. So much of what happens online revolves around content. It’s how you get found, why people pay attention and how you start to exchange value. Without a content platform to build from a great deal of effort in other stages will be wasted. To me the content platform starts with building a listening station with tools like Google Alerts, TweetDeck, Trackur, Social Mention, Sprout Social or Radian6. From this point you can you can gain insight into your market, your competitors and important groups, such as key journalists, while starting the work of better understanding your most important keyword phrases. Keywords are like chapters in your total body of content plan. Doing research, using tools such as Google Keyword Tool or Wordtracker, on the most important ways to show up when people search for a business like yours and creating blog posts around these chapters, using an editorial calendar approach, is how you fortify your content platform. Once you start consistently creating content, you can produce valuable eBooks that will be the pivotal element of your email lead capture stage. There’s really very little reason to play this game if your don’t put the effort in at this stage. Having someone type a search phrase that is key to your business and finding a blog post or page from your site on page one of the results is the ultimate payoff and, long-term, may be the difference between success and failure. Search Engine Optimization can be complex and time consuming, but most businesses can generate significant results without making it so, if you simply focus on the following three elements. Produce keyword rich, educational content – we covered this above, but search engines live on blog posts and other educational content. Use a tool like Scribe from Copyblogger to help you write more search engine friendly content. Make it easy on the search engines – Make the on page elements such as your blog titles, URLs, ALT image attributes, subtitles and internal links work for you and use XML sitemaps that make it easy for search engines to grab your latest. Check out Search Engine News for great primer. An engaged email list, eager to hear from you, is the most valuable asset your can build. 1000 responsive email followers trumps 25,000 Twitter followers every day when it comes to actually promoting the things that make your money. Focus on building a list of email subscribers that want to hear from you and social media will become a tool set to help you do more of that. Choose an email service provider (ESP) such as Constant Contact, GetResponse, AWeber, MailChimp or Infusionsoft and go to work on building email capture forms with the offer of your free eBook or weekly newsletter before you move on to social media. This is certainly an area where you should consider strategy before tactics. The first step is to understand how your current customers are using social media and how you can use social media to somehow serve them better. If you do that, you’ll get immediate value. Create Twitter lists of customers and add their social profiles to your CRM tool. Add a tool like Rapportive to your email. Then claim and build your profiles on Facebook, LinkedIn, Google+, YouTube, Picasa, Slideshare and Pinterest. Your plan to work and engage prospects in all of these networks may not be clear yet, but the first step is to claim the free real estate so you can start exploring. Once you start to share content, build connections, reshare other people’s content and discover best practices in each individual network, you can begin to amplify your content and start finding ways to drive prospects to your eBook and newsletter in an attempt to start a relationship headed towards conversion. Many people waste advertising and then conclude it doesn’t work. Pay per click advertising can be very effective when done right. One of my favorite things about it is that a platform like Google AdWords allows you to test your thinking a dollar at a time. Here’s my take on how to make ads pay – Use your ads to drive content awareness instead of simply to sell. Drive Facebook users to sign up for your eBook first and then you can sell them over and over again. The basics of PPC are this: Use lots of punchy, dramatic ad copy, but test, revise and test. Create tightly focused ad groups with highly relevant ad copy, work negative keywords out of your list. Test some more. Mobile is more of a behavior than a tool. The first step is to analyze what behaviors your customers are exhibiting before you dive into or dismiss Foursquare or text messaging. I can assure you this however, your customers are reading content, searching for things to buy and using reviews to make decisions on mobile devices. Claim your location based profiles in places such as Foursquare and Yelp. Create mobile and tablet friendly viewing options with tools such as WPTouch, Tekora or GoMobi. Start creating mobile specific ads, landing pages, coupons and offers that take advantage the growing use of mobile devices as a major part of the purchasing process. Like many stage-based processes there is a cyclical aspect as well. For some, creating benchmarks and key performance indicators is really the first step. So, if you’re one of those folks you can start here, because no matter where you are in the process this stage will always evolve. Many people can’t start the process of measuring success until they are measuring in real time or can’t start the process of tweaking and testing until all of the elements are in place. As you build make certain you install tracking code from a tools such as Google Analytics, Spring Metrics or KissMetrics so you can begin to build the data to test and refine from. Then you can start building conversion goals, funnels and events, tracking your ads and split testing your landing pages, opt-in pages and sales pages to discover ways to increase conversion. Even something as overwhelming and complex as the changing face of marketing online get just a bit more manageable I think when you start to view it as a system.